“We are all human beings, and we have dreams … ” A strange and haunting documentary, Deep Water details the tragic story of Donald Crowhurst (1932-69), a British inventor, businessman and rather inexperienced “weekend sailor” who entered the 1969 Sunday Times Golden Globe Race, the first round-the-world yacht race. Crowhurst’s solo voyage aboard his unproven vessel, Teignmouth Electron, was plagued with problems even before he left the dock but he forged ahead knowing that his family would face the loss of their home if he failed. To make matters worse, the field of competitors included some of the best yachtsman in the world—he obviously had little chance of success. What follows in this deeply disturbing real-life tragedy includes deception, insanity and death: “Don Crowhurst sailed over the horizon and effectively into oblivion.” This fascinating documentary, which was directed by Louise Osmond and Jerry Rothwell, features many revealing interviews with Crowhurst’s family, friends and competitors, including Robin Knox-Johnston. It also gives viewers a good idea of the vast emptiness in the ocean, as well as the loneliness and fear faced by these intrepid voyagers. An interesting side story is the case of another competitor, experienced French sailor Bernard Moitessier (1925-94), who had a very good chance of winning the race but opted instead to keep sailing toward Tahiti. 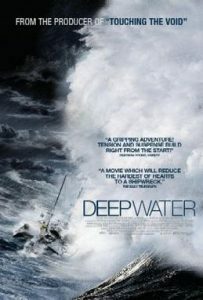 Deep Water won the Best Documentary award at the 2006 Rome International Film Festival.